It's going to be a huge summer for us in terms of recruitment, and conversations with the owners are coming - we have to recruit well, be strong next year and bounce back. We just need to turn the ship around and get promotion." I gave them a rocket at half-time and we started the second half quite well but couldn't make our possession count." 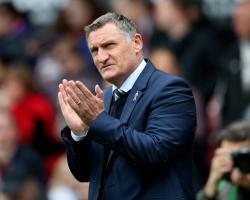 He has done a great job there and if he's allowed to keep the players he has, and the club keep him, then I'm sure they'll be knocking on the door to come back up next season."